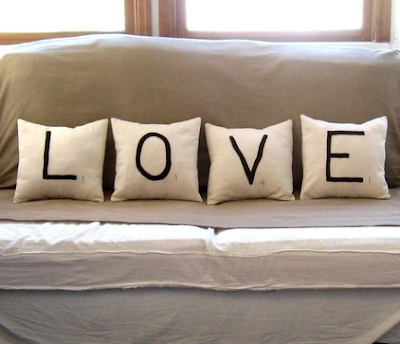 Inspired by these Scrabble pillows by Pillowhappy, I asked for a sewing machine for my birthday—how hard can it be to sew a few pillows, right? Went to Joann Fabric & Craft today purchased a starter sewing kit, cream fabric and some black felt. Got my machine all hooked up, started cutting fabric and duh... lost. Thank goodness for gooogle, I was able to find these great how-to videos by cyberseams.com. I will keep you posted on my progress.